Frolik’s backhander eluded Howard to give the Blackhawks a 4-2 lead in the third. 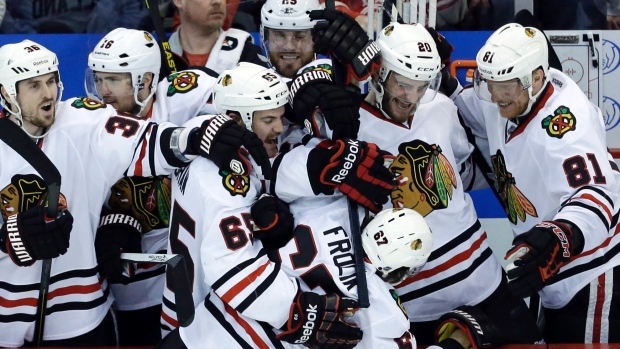 The Hawks would survive a furious push by Detroit to win the Game 4-3 and send the series back to Chicago for Game 7. Of course in Game 7 Brent Seabrook’s overtime heroics sent the Blackhawks back to the conference finals, but we’ll get to that goal later. 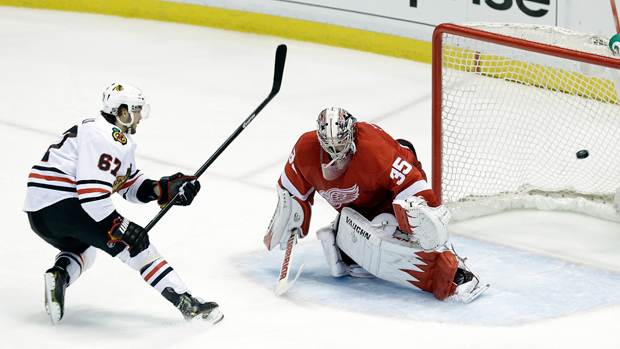 Michael Frolik beats Jimmy Howard on a penalty shot to give the Blackhawks a 4-2 third period lead in Game 6. This goal is important for a multitude of reasons. Many people (including myself) gave up on the Blackhawks when they went down 3-1 to Detroit after Game 4. They looked beaten, scared. and couldn’t get the power play going whatsoever. Once again down in the third period, and on the brink of elimination, the Hawks rose up with a three goal period to stun arch rival Detroit. The next game would be even more stunning. The Blackhawks – Red Wings rivalry is one of the fiercest in the NHL. After the 2013 season the Wings moved over to the Eastern Conference. This series was the last time that the Hawks and Wings would get to duke it out in the West/Campbell playoffs for a very long time. The Blackhawks closed out the rivalry on top in arguably the toughest series victory from the past six seasons. Frolik’s penalty shot here in 2011 in Game 6 vs. Vancouver would tie the game in the third period. Later in overtime the Blackhawks would win and send the series to a decisive Game 7 on Ben Smith’s goal.